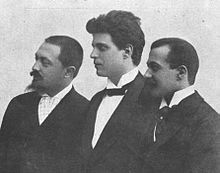 Sometimes the libretto is written in close collaboration with the composer; this can involve adaptation, as was the case with Rimsky-Korsakov and his librettist Vladimir Ivanovich Belsky [ru; de], or an entirely original work. In the case of musicals, the music, the lyrics and the "book" (i.e., the spoken dialogue and the stage directions) may each have their own author. Thus, a musical such as Fiddler on the Roof has a composer (Jerry Bock), a lyricist (Sheldon Harnick) and the writer of the "book" (Joseph Stein). In rare cases, the composer writes everything except the dance arrangements – music, lyrics and libretto, as Lionel Bart did for Oliver!. This page is based on the Wikipedia article Libretto; it is used under the Creative Commons Attribution-ShareAlike 3.0 Unported License (CC-BY-SA). You may redistribute it, verbatim or modified, providing that you comply with the terms of the CC-BY-SA.